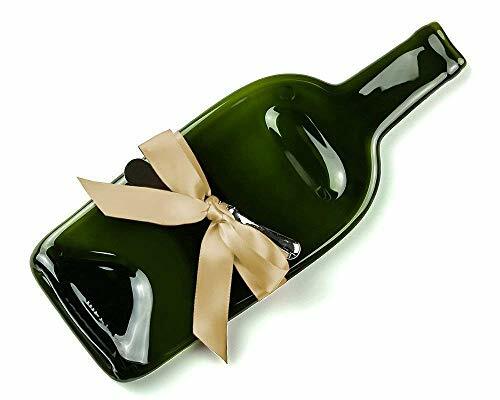 Enjoy your wine and cheese in style with this beautiful green wine bottle that has been melted flat into a unique serving tray. Makes the perfect gift for the person who has everything! This melted bottle cheese plate is a nice dark green glass and comes with a stainless steel cheese spreader tied on with an elegant berry color ribbon and four small rubber feet to protect your tabletop. 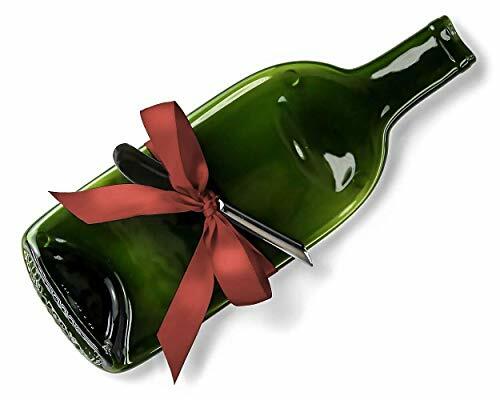 This is a 750 ml size bottle and measures approximately 12" x 4 3/8" inches (This is a recycled wine bottle and may have minor imperfections and/or slight variations that add to its upcycled appeal). Thank you for supporting American craft. 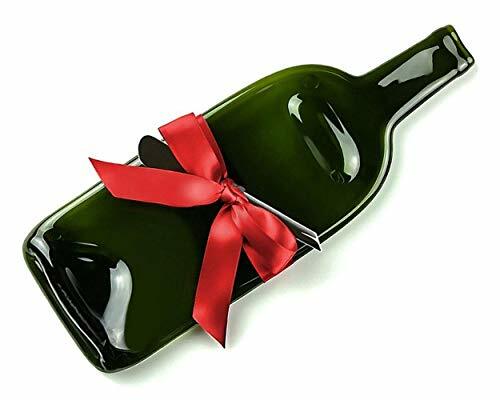 This wine bottle has been melted flat and can be used as wonderful, one-of-kind, serving tray. Makes the perfect hostess or host gift for any holiday party! This melted bottle cheese plate is a nice dark green glass and comes with a cheese spreader tied on with a bright red elegant ribbon and four small rubber feet to protect your tabletop. This is a 750 ml size bottle and measures approximately 11 1/2" x 4 1/4" (This is a recycled bottle and may have minor imperfections and/or variations depending on the type of bottle that add to its upcycled appeal.) Handmade in the USA by me! Thank you for supporting American craft. The cheese board that can do magic is here for you. 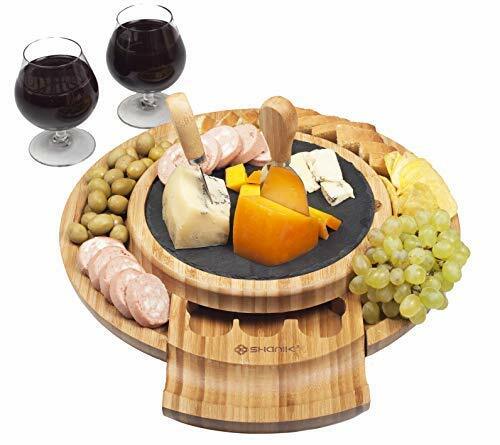 Transform any meal into a special occasion with this 5PCS CHEESE BOARD SET. The busy days are here to stay and you need to make the most of your spare time. A special dinner takes hours to prepare and you just do not have that kind of time. Here is where this simple round cheese board can step in, saving you from hours spent in the kitchen to impress your house guests. Just buy the cheese that you love, and anything that you like to match it with, including that special wine, and voila, things are done. Why? Because these simple foods arranged on this cheese board will steal hearts and make mouths woo. And who doesn't want to be known for throwing great dinner parties? The 100% bamboo cheese board design looks modern and smart and is non-porous. That means you can enjoy that stinky cheese you love as often you want without afterwards dealing with the smell because odours do not get stuck on the board. 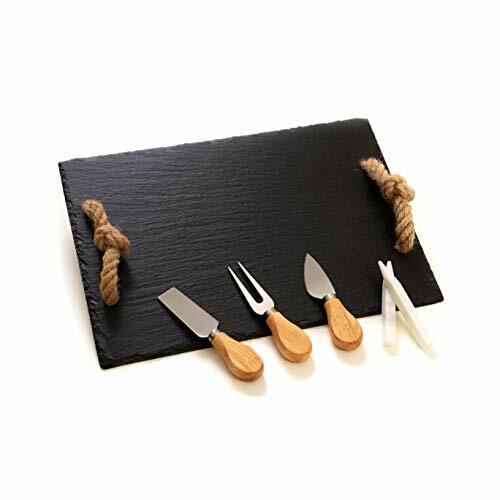 The cutlery is made of great quality steel, and provided with easy grip handles, so you can use them safely and sound, no matter how hard to slice your favourite cheese is. In the hidden utensil drawer, you will find a Parmesan shaver, a soft cheese knife and a Parmesan/ hard cheese knife, all very easy to use. Gorgeous amber, light amber, or pale green (depending on what I find at the recycle center) color melted wine bottle cheese plate. 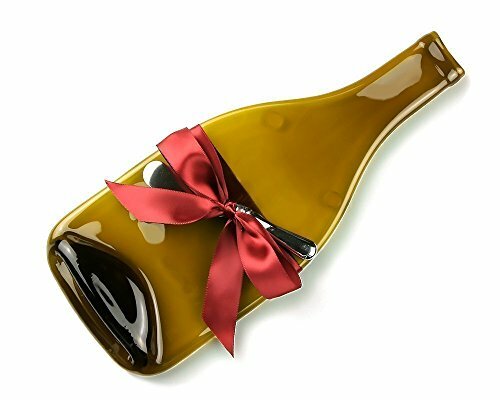 This bottle is a sloped shouldered "Burgundy Bottle" shape and is generally used for Chardonnay and Pinot Noir. This shape is also used for many Loire Valley wines--à la votre! This melted bottle cheese plate is a nice amber glass and comes with a cheese spreader tied on with elegant ribbon and four small rubber feet to protect your tabletop. This is a 750 ml size bottle and measures approximately 12" x 5" (This is a recycled bottle and may have minor imperfections and/or slight variations in color that add to its upcycled appeal.) Handmade in Pennsylvania, USA. Thank you for supporting American craft. Bring the elegance of fine china to your luncheon but save the cleanup for another day. Our paper plates feature timeless design, beautiful graphics and practical disposability. Coordinate with our napkins, trays and more for the perfect party. Brought to you by Michel Design Works, creator of luxurious, all-natural bath and body products, delicately scented soy wax candles, irresistible baby gifts, and beautiful stationery products. Michel Design Works creative design and attention to detail ensures every gift they make will be a joy both to give and receive. 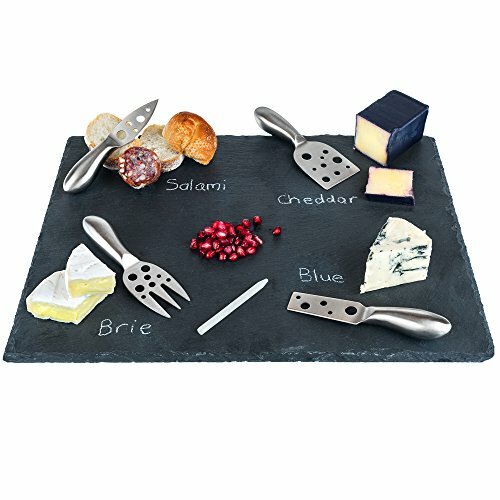 Looking for more Wine Cheese Plate similar ideas? Try to explore these searches: Tigers Game Day Ceramic Chip, Black Baby Boy Doll, and Big One Satin Button. Look at latest related video about Wine Cheese Plate. Shopwizion.com is the smartest way for online shopping: compare prices of leading online shops for best deals around the web. 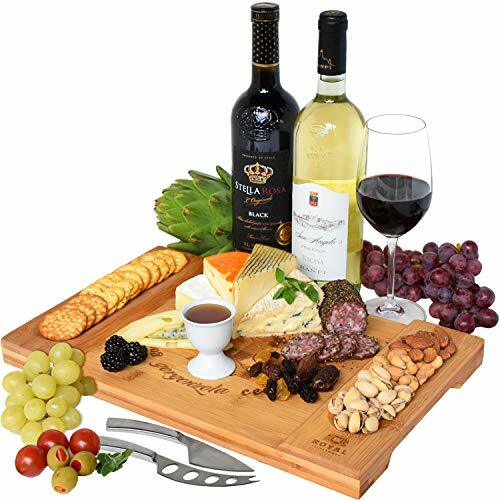 Don't miss TOP Wine Cheese Plate deals, updated daily.